Plankton are the tiniest and most important organisms in the Sound since they form the basis of the food chain and are crucial for all life in Howe Sound. Unfortunately, their levels have not been surveyed since the 1970s. Although the recovery of whales in the Sound suggests that plankton populations have improved, regular monitoring is needed to track the abundance and productivity of these organisms. Reviewer: Stephanie King, Sea This Consulting, Nanaimo, B.C. Chances are with other changes occurring in Howe Sound, plankton, the tiny organisms at the base of the food chain, may be changing too. The problem is we don’t know what’s happening because no one is currently doing any research in this area. The last time any extensive plankton surveys were undertaken in Howe Sound was in the 1970s, so we currently have no data to tell us if there have been any changes in plankton biomass and the timing of their cycles. 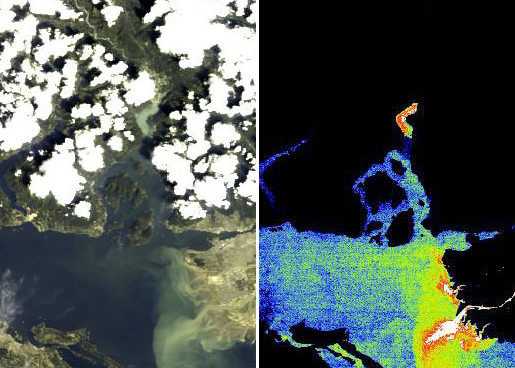 We can observe phytoplankton blooms remotely by sensing water colour using a satellite sensor such as MERIS, with its 300 meter spatial resolution, but this sensor is no longer in operation. Early in 2016, the European Space Agency launched the OLCI sensor onboard the Sentinel-3 satellite, which has the same resolution and data will be available soon. In August 2016, Howe Sound turned bright turquoise-green with its first large-scale coccolithophore bloom. 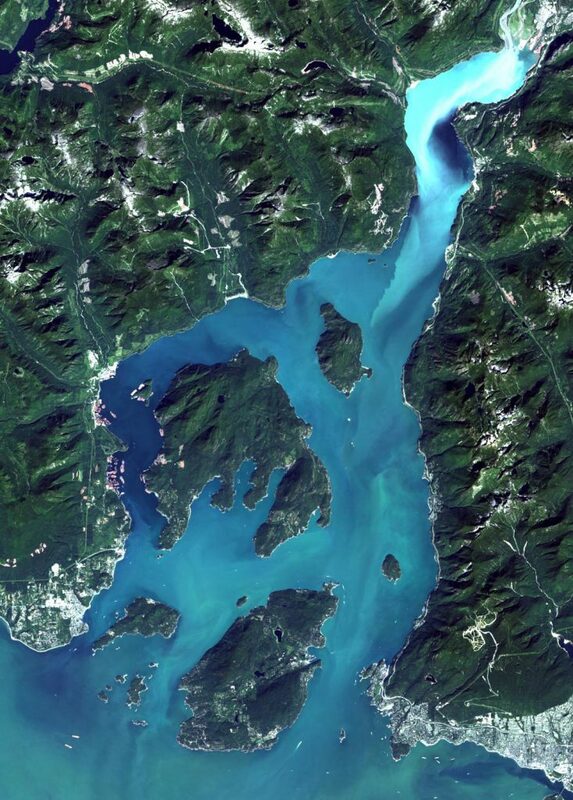 Plankton blooms in Howe Sound haven’t been scientifically studied since the 1970s. Phytoplankton (i.e., plant plankton) are microalgae and they are the main primary producers of food in the sea (the ‘grass of the sea’). They combine carbon dioxide, nutrients, and sunlight via the process of photosynthesis to produce organic carbon and provide food for the animals in the food chain. They can ‘bloom’ and increase their biomass by 1,000-fold during spring, when conditions are just right (high nutrients, good light and little wind). Zooplankton (i.e., animal plankton, Figure 1) range in size from microscopic to a few millimetres. 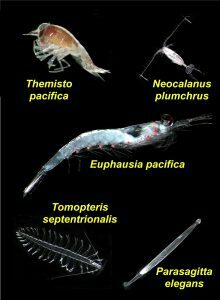 They are the ‘insects of the sea’ and are the main grazers of phytoplankton, and then small fish and invertebrates feed on the zooplankton and so on up the food chain. Without plankton, the food web of Howe Sound would collapse. Forage fish such as herring, sandlance and smelt would disappear, as would the salmon, dolphins and humpback whales that eat the great schools of these small fish. Figure 1. Some dominant zooplankton in lower Howe Sound, scaled to relative body size. Top row is the hyperiid amphipod (Themistro pacifica), and large copepod (Neocalanus plumchrus). Middle: the euphausiid (Euphausia pacifica). Bottom: the planktonic polychaete (Tomopteris septrionalis) and the chaetognath (Parasagitta elegans). (Photos are copyright Dr. Russell Hopcroft, University of Alaska, and reproduced with permission). The current state of the health of plankton is unknown. In the 1970s, John Stockner, Colin Levings, and others from Department of Fisheries and Oceans (DFO) West Vancouver Laboratory began a three-year extensive bio-oceanographic survey to provide a better understanding of plankton and their distribution and production at multiple stations throughout Howe Sound. Their studies revealed information on the dominant species of phytoplankton, timing and production levels of the spring phytoplankton bloom, and some data on zooplankton. Changes in the timing of this spring phytoplankton bloom due to warmer surface waters (earlier bloom) or too much wind (later bloom) could produce a timing mismatch and may impact the growth and survival of zooplankton if they arrive before the phytoplankton bloom (too early) or well after the bloom (too late). Figure 2. Vertical section along the main channel of Howe Sound showing the depth profile with the prominence and the shallowness of the “sill” at little more than 50 metres depth. (The main channel was cut by glaciers during the Ice Ages, and the sill is a moraine that was left at the toe of a glacier during a short-lived advance at the end of the last Ice Age.) The head of the inlet is on the left. Once phytoplankton “bloom,” they move with the currents, so understanding the dynamics of currents and tides is particularly important. 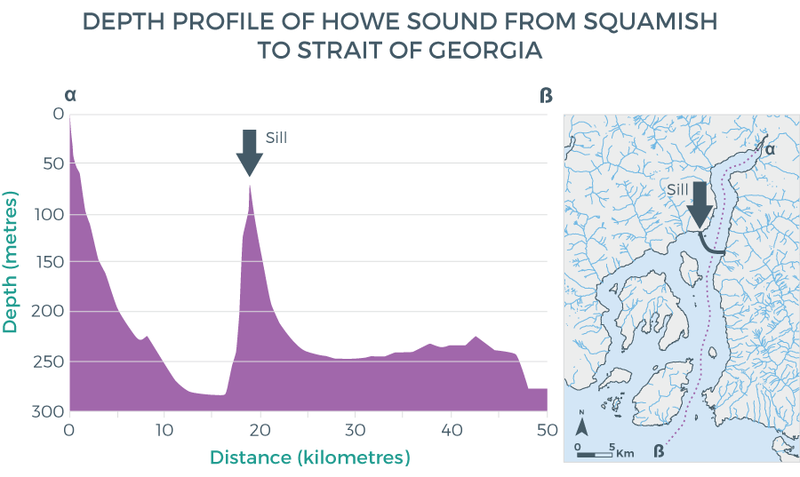 In the upper portion of the Sound, a prominent “sill” or shallow topographic barrier/boundary prevents complete mixing of deeper waters of this zone with the lower Howe Sound waters and hence is likely of para-mount importance to the biological activities (Figure 2). Some current threats to healthy phytoplankton production include climate change with the dual impacts of increasing CO2 (ocean acidification), and the warming of surface waters (global warming). However, we can surmise that current plankton production is relatively healthy, when we consider anecdotal indications of recovery from the 1970s and 1980s stressors. We have seen the return of significant numbers of herring and along with them the return of marine mammals; dolphins and whales now occur in the inner waters of the Sound along with increasing numbers of harbour seals. Keep an eye out for unusual blooms and continue to ask what they are and why are they occurring in the Sound. True colour satellite imagery, useful for monitoring coccolithophore blooms and turbidity, can be viewed in near real time on NASA’s Worldview. The satellite images will be the “webcam” for active citizen science groups that are interested in on-going plankton events in the Sound. Conduct a survey, preferably utilizing the same DFO stations in the 1970s, so valid comparisons of decadal changes can be made. This survey should include standard physical, chemical (nutrients, oxygen) and biological (dominant species, phytoplankton and zooplankton biomass, and primary productivity) parameters. What species are being lost or gained (i.e., changes in biodiversity) due to climate change and what are the changes in plankton/ecosystem productivity? Information on zooplankton, an important food source for many small fish, is lacking and should be conducted similar to an on-going study on zooplankton seasonal succession in another fjord, Rivers Inlet, up the B.C. coast. Continue the practice of testing water quality in front of the Port Mellon pulp mill to determine if the present mill is meeting provincial and federal marine foreshore water standards. Similarly, if an LNG terminal at the old Woodfibre site is approved, then an extensive survey will be needed to determine the “before” or baseline inventory and continued monitoring if it begins operations. Make baseline inventory and regular monitoring of plankton (the key food resource for all higher trophic levels) a requirement for coastal development projects, so that any changes in production, diversity, or timing can be assessed. Collect important historical data on the Sound (before scientists and other groups retire) and archive the data in a government data centre.